Is your email marketing strategy truly effective? Who will ultimately be a digital winner? “Marketers who figure out how to make email and mobile work together to win customers, drive sales and bring them back after the season ends,” said Dave Walters, strategic marketing evangelist for IBM Marketing Cloud, at a Marketing Effectiveness Forum. Email can help narrow the gap between browsing and buying on smartphones. In turn, smartphones can bring new email subscribers and widen the email messaging programme beyond the traditional inbox, he explained. However, email is still perceived as a no cost – a misconception that needs to be corrected soon. Very soon, according to Walters, marketers will feel revenue pressure on email. “The revenue pressure on email marketing spends is coming, if it hasn’t already. Your bosses are going to sit on you asking for real revenue per email numbers, so marketers better be moving that way,” he said. Marketers now have a wealth of information from customers at their disposal – time spent on marketing messages, interest levels, brand affinity and so on – something they never had at such a scale. As email marketing enables marketers to communicate with many, in a manner that is scaleable, yet personalised, what marketers need to do is capture consumer behaviour and preferences as well as they can. “It is how we take that into account, making buyer personas and accurate assumptions about our audience, drill deeper into that data – for us marketers that is the moment of shine,” he said. At some level, sending emails is seen as a litmus test for a marketer. “I have met marketers who are a little too enamoured with their ability to send messages and not as focused on what they should be doing before they send those messages,” he said. However, just sending the email isn’t good enough. If you subtract the credit of sending the most amount of messages, then you start to think through the revenue opportunity – and that’s what’s needed. “If someone has not opened an email from you in a year, it is ludicrous that you will include them in your emailing list,” he said. While it may be a matter of comfort to have a huge mailing list, it is nothing, but a vanity metric. What marketers must therefore focus on is the top revenue segment after carefully assessing the database and conversion percentage with it. “If marketers in the world chopped the 80% chaos in their marketing plan and said all I want to care about are our best customers, where do I find more of them and how do I absolutely, have the conversation that almost every single one of them wants to buy – that would be it,” Walters said. Another common mistake marketers commit is to overlook the costs involved in getting email marketing right. Costs associated with headcount is one of them. So, if marketers understand revenue, ROI or how to deploy the budget in the right places then it is a different conversation they will have. As opposed to being told end of year that they have overshot the budget, they will be going to the bosses mid-year, saying we have got this programme that we’re running and creating CLV customers at a certain amount on this paid media spend on social media but we want to stop doing it and redeploy the budget on another channel which is proving to be incredibly high in driving ROI. Here is a summary of all that was discussed with the delegates over three roundtable discussions. When thinking about where to begin with behavioural marketing, many of our attendees were already making strides – even if they didn’t realise it. When they deliver the best reactivation offer to those who have spent the most in the past six months, it is embracing the principles behind behavioural marketing. For many attendees in the hotel, food and beverage and travel industries, the basics of factoring in for customer behaviours comes in the form of loyalty programmes, but even some of the small businesses attending are thinking deeply about how to pay closer attention to their buyers. While we talked through many specific examples, everyone agreed with the big-picture idea of improving their customer’s overall journey (even if that term is still gaining traction). For many of the more B2B-focused firms, this means thinking more deeply about the content strategy that uncovers and nurtures their best prospects and turns them into profitable customers. It also means every company should be focusing on how to both retain and delight their existing customers – and be working hard to develop advocates throughout the customer life cycle. And while many ASEAN marketers are still focused on mass media to drive awareness, I heard a wide range of roles and experience levels thinking more deeply about more one-to-one strategies based on tactics from the database marketing and direct response worlds. Marketers are facing challenging times nowadays. We’re doing more with less – targeting core audiences and geographies using more channels (online and offline) than ever before. Marketing automation allows marketers to effectively manage and nurture your leads, maximising the marketing budget and automat marketing processes. With that, marketers will understand more prospects behaviour, and scores on that behaviour, ensures that customers will receive personalised messages or information at the right time and in the right channels. Marketers can also create multi-track workflows using email, direct mail, social media, SMS, mobile push and telesales. Keep track of the customers’ behaviours and steps – and know what keeps them engaged. With marketing automation, marketers leverage those behaviours to react to steps taken as well as anticipate future actions so that marketers can spend less time managing manual tasks and spend more time on marketing strategies. It’s not a one-day job. Before executing marketing automation, marketers need to have the proper discussion internally with other business units (such as the sales department and customer service department) to finalise the customer communication plan/process. Once strategies and processes have been determined, the marketing performance will prove all the effort is worth it. The landscape of email marketing has fundamentally changed as consumer expectations have grown, and as marketing heads are increasingly focused on providing a better and more relevant customer experience that leverages multiple channels. Additionally, with the tools and technology available, the expectation on marketers to track, test and prove ROI has never been higher. Emails are no longer being seen as one-off campaigns to drive sales, instead the focus is increasingly on leveraging email as a channel of engagement, and then tracking the effectiveness back to overall campaign objectives. 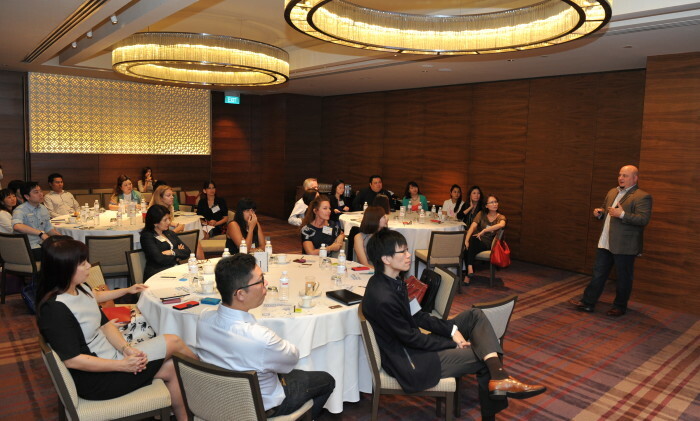 During the roundtable exchange, personalisation was agreed upon as the most important factor in most organisations’ email marketing strategies. We saw a variation of personalisation tactics in the different industries, but all agreed that personalisation and relevance has moved beyond using “dear first-name”, and we explored how to use on and offline behaviours to further personalise every email communication. Retail and e-tail delegates were said to experience the best open and click rates on Sunday nights whereas airlines and financial institutes received the best open and click rates on Friday mornings. Subject lines were agreed to be an important contributing factor, with most regularly conducting A/B tests. of transactional emails to provide real-time relevant cross and upsell offers in key communications was also explored and something that e-tailers are increasingly looking to adopt. According to our 2015 Email Marketing Metrics Benchmark Study, transactional emails generated an average 44.9% open rate and was even better for top email marketers with a 72.2% open rate. The participants all agreed that email marketing remains an essential engagement channel for every brand. Having the right email marketing and customer engagement strategy strengthens the relationship between the brand and its prospects and directly retains customers for long-term loyalty and success.